With some fanfare I announced to the world in January that I would undertake two daily practices this year: 1) a tapestry diary in which I work through the techniques in Mette Lise Rössing's book The Thread's Course in Tapestry and 2) a perpetual journal of botanical drawings, inspired by Lara Gastinger (@laragastinger and #lgperpetualjournal on Instagram). I have done OK with the tapestry diary, but I haven't woven every day by any means. So far I've done 39 techniques in about 100 days. At this point, here's where it stands. I chose to work in the wintry palette of northern New Mexico for the first quarter of the year. I'm looking forward to updating the palette with a few yellow-greens soon. They are starting to appear, oh so slowly, here. I knew that with my teaching schedule and life intervening in general that I wouldn't weave every day, and that's fine. Eventually I will finish. The tapestry diary is supposed to be fun, in my book, not homework. I had an aha moment when I realized that at the end of the year I'd like to be able to connect each technique in the book to its bit of weaving in the tapestry, so that I can use the diary and the book as references. 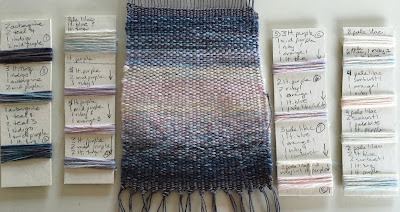 So I took a photo of the weaving so far, printed it out life-size, and cut out each little daily bit and glued it right into the book (gasp!). I've always liked the idea of making my own textbook and this certainly makes Rössing's excellent book even more useful for me. As for the second daily practice, the perpetual journal, I did start it with great enthusiasm, but then, it was winter. Winter went on and on. And on. It was harder to get outside and find things to bring in to draw. And meanwhile life got very very busy. So while I've enjoyed very much seeing what other people are drawing in their perpetual journals on Instagram, mine has been stalled here. I hope to get back to it, really I do. It's about priorities, isn't it? And my main focus these days is making work for the upcoming Eldorado Studio Tour May 18-19, here in Eldorado, New Mexico, near Santa Fe. 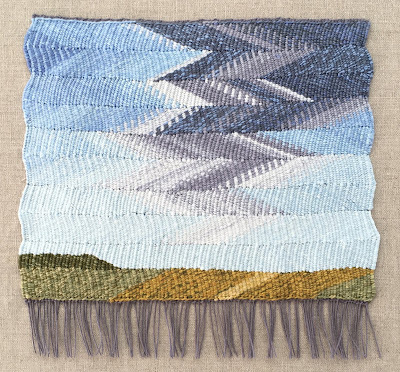 I'm hoping to have three pieces in my series of wedge weave skies, and another three pieces in the new Fences series, in addition to work from last year's show in Atlanta. Virga, (c) Molly Elkind, 2019. Cotton. 7.25" x 9.25"
I had great news last week--one of the wedge weave skies, Virga, has been accepted to the Small Expressions show sponsored by Handweavers Guild of America. So while it won't be available for the Studio Tour, it will get to travel a bit. I guess I'd better get back to the loom. . . .
Collage to Cartoon at Weavers Guild of Minnesota, or, The Teacher Learns a Few Things, too! I'd been excited for months about the prospect of teaching at the Minneapolis Textile Center for the Weavers Guild of Minnesota. I told anyone who would listen how, as a new student in fibers in the mid-1990s, I read about the Textile Center's founding in Fiberarts Magazine and dreamed of visiting such a wondrous place. Little did I think I would ever teach there. The experience exceeded my expectations, despite the best efforts of an airline-that-shall-not-be-named (hint: named for a region of the country and known for blue airplanes) to delay both my arrival and my departure from the Twin Cities, and to make rescheduling impossible without two in-person trips to the airport. But Betsy Konop at the Textile Center and Robbie LaFleur at the Weavers Guild rolled with the punches, rescheduling my Thursday night lecture to Friday night, chauffeuring me around, making sure my tech was set up and working perfectly, and generally taking care to see I was fed and entertained. Thank you, Betsy and Robbie! 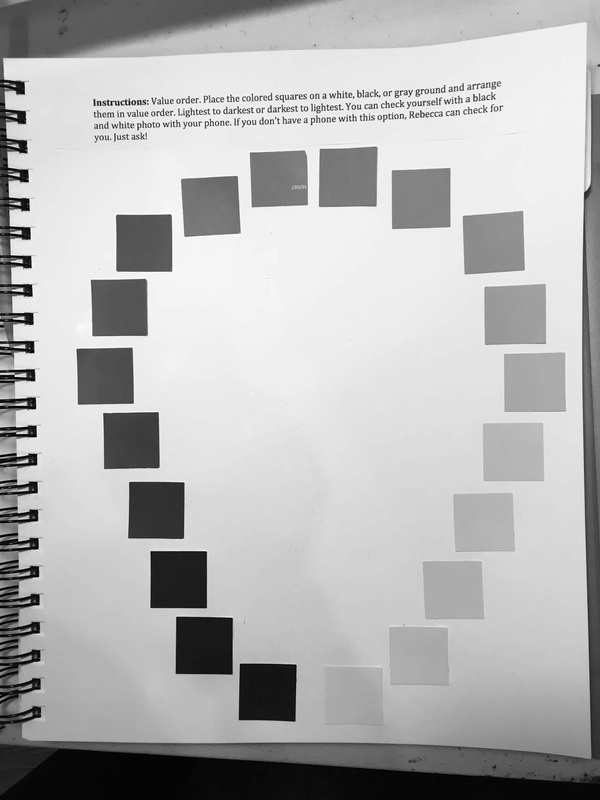 And thanks, Robbie, for your kind blogpost about your experience in the workshop. The students in the class worked very hard and very well. They gamely tackled every exercise I threw at them, made wonderful collages, and began weaving samples before the weekend was over. 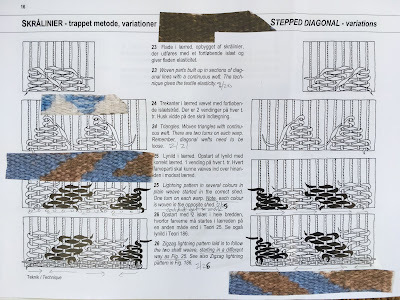 I was reminded of some of the stumbling blocks that can impede a new weaver's progress, and I learned a little more about how to effectively teach this subject I am so passionate about, designing for tapestry weaving. Leading up to the visit, I had seen online tantalizing glimpses of a show of Scandinavian weft-faced weavings that was on display at the Center, and I hoped I would have time to see these wonderful pieces while I was there. As it turned out, the pieces lined the walls in my classroom! 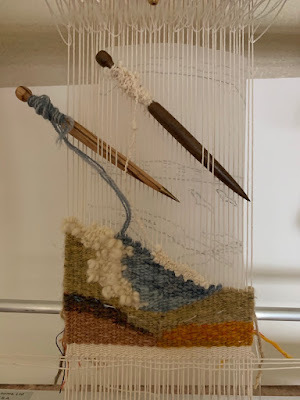 I was especially delighted to have a chance to talk at some length--though I know we only scratched the surface of the subject--with Robbie LaFleur about Norwegian tapestry. In the Twin Cities, where so many are of Scandinavian ancestry, that weaving tradition is a focus of intense attention. 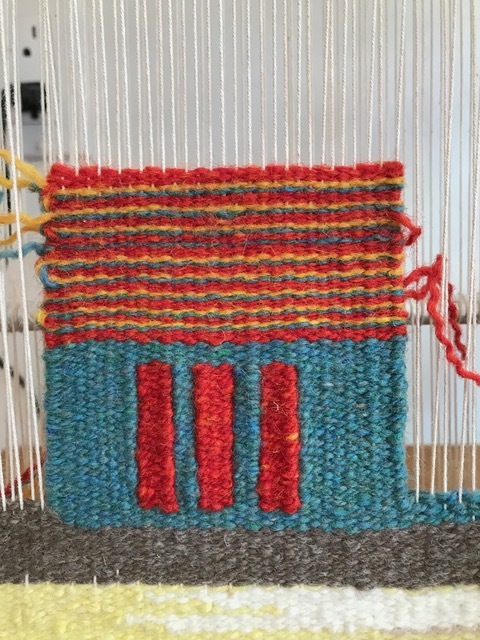 I learned that in Norwegian and other tapestry traditions, slits are not used, but rather dovetails and other types of decorative joins--dozens of types of joins!--and the backs are a perfect mirror of the front, with all weft tails needled in. I resolved to buy my own copy of Norwegian Tapestry Weaving by Maria Brekke Koppen, in order to study those joins. 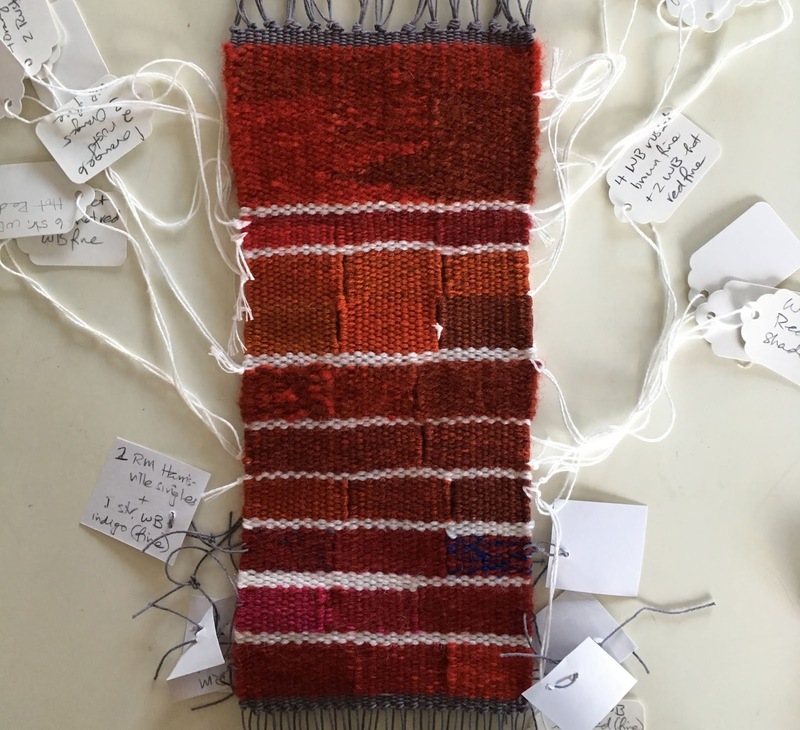 Robbie also shared this call for entries for fiber pieces in any medium inspired by the famous 11th-century Baldishol Tapestry from Norway. While at the moment I do have ideas for tapestries lined up like planes on the runway (ahem) waiting to be woven, I am mighty tempted to do something for this as well. I love looking at tapestries and fiber online. Facebook, Instagram, ATA newsletters, and other weavers' blogposts are wonderfully inspiring. But nothing beats meeting weavers in person and getting our fingers into the "space between the warps" together. Thank you, weavers of Minneapolis! Weekend before last, I taught my first workshop in New Mexico, at Española Valley Fiber Arts Center (EVFAC), a major hub of all things textile in the state. * Six students from around the country braved wintry weather (we did get 6" of snow one night!) 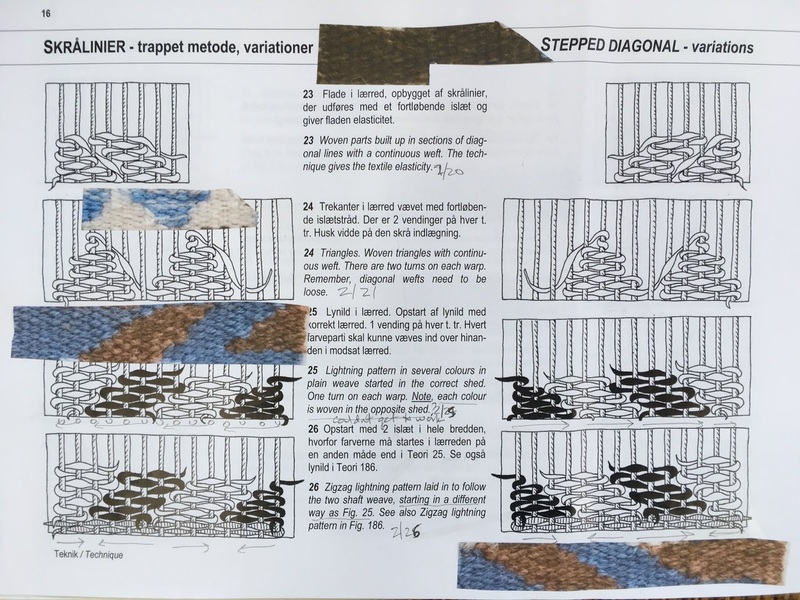 to learn more about how collage can be used to generate a weave-able design for tapestry. They made collages, did yarn wraps to test color ideas, translated their collages into tapestry cartoons, and began weaving samples. By the way, I am teaching Collage to Tapestry Cartoon at two other venues this year: the Weaver's Guild of Minnesota in Minneapolis, March 13-17, and at the Mid-Atlantic Fiber Association conference (MAFA) in Millersville, PA June 27-30. I'd love to see you in either location! Here are a few photos from the three-day workshop. Marlena begins to assemble a landscape collage. Wendy ponders two of her collages. . . . and a beautiful palette of yarn. Patricia has several strong collages from which to choose to work. Wendy and Janice look at work so far. Evelyn and Cindy give each other constructive feedback before deciding which collages to develop into cartoons. 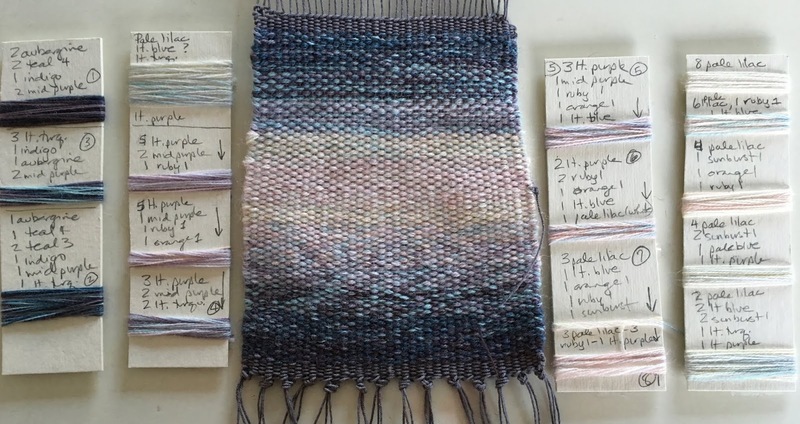 Cindy makes yarn wraps to test colors before weaving. Those are all her hand-dyed wools! Patricia begins to weave a sample of the colors in her collage. Marlena's sample in progress. Excellent texture! Wendy's sample, above, and collage, below. I love how in this class each student's work is uniquely theirs. 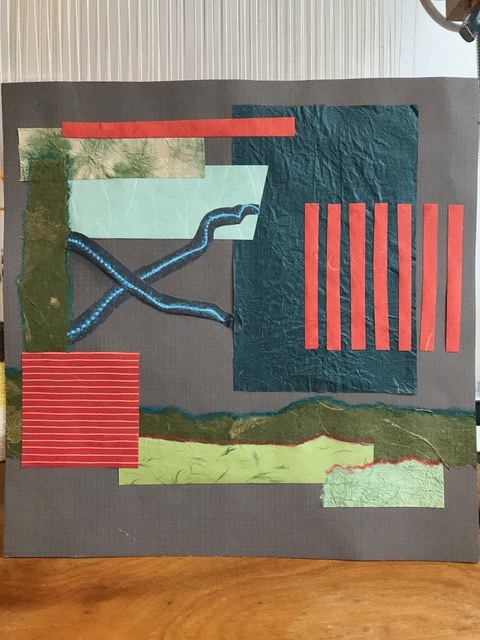 Each student makes several collages which express their own style and tastes, and then everyone makes their own choices about how to develop their collages into tapestry. 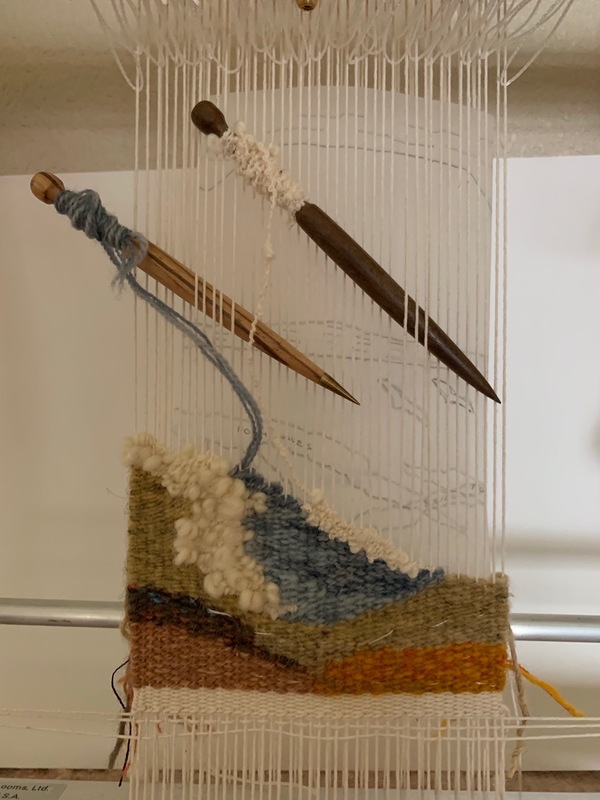 My teacher's heart was warmed when I heard a few students confess that they are now converts to doing the "adult" thing and making samples before starting to weave their tapestries for real. I can't wait to see what they all do next! Color, pattern and weaving in Guatemala! I arrived home a few days ago from a textile tour of Guatemala led by Debbie Maclin of Spanglish Fabrics. 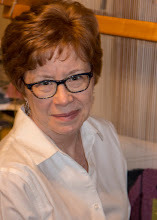 Debbie was a Peace Corps volunteer in Guatemala some time ago, and she has been working with weavers there for years to make fabric and other items to import into the United States and sell in her Etsy shop. I was excited to join her first official textile tour, in the company of three other interested--and interesting!--women. Debbie's contacts in the weaving community and her deep knowledge of local markets, customs, and the language ensured that we had an immersion experience. I am still processing everything I saw. It was my first trip to Central America, so everything was new to me. Some spectacular Spanish Baroque architecture survived the Antigua earthquake of 1773. The many churches and convents that were damaged remain as picturesque ruins now. You could spend days exploring those ruins and related museums. The first market we went to in Antigua was adjacent to a ruined church. La Merced Church in Antigua, one of several examples of wedding-cake style Baroque architecture. We stayed in Panajachel on Lake Atitlan for several nights, and rode a launch across the lake to our weaving workshop in the lakeside village of San Juan la Laguna. But of course the weaving and fabrics were why I was there, and I was completely blown away by them. 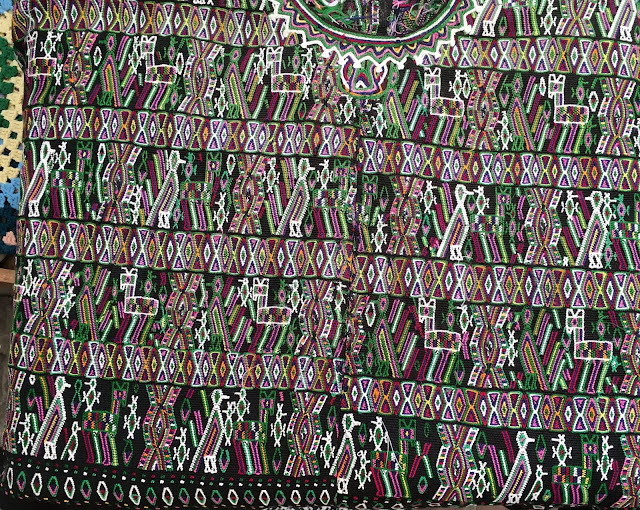 Pictures in books or online cannot do justice to the intricate weaving and vivid color of the work in real life. 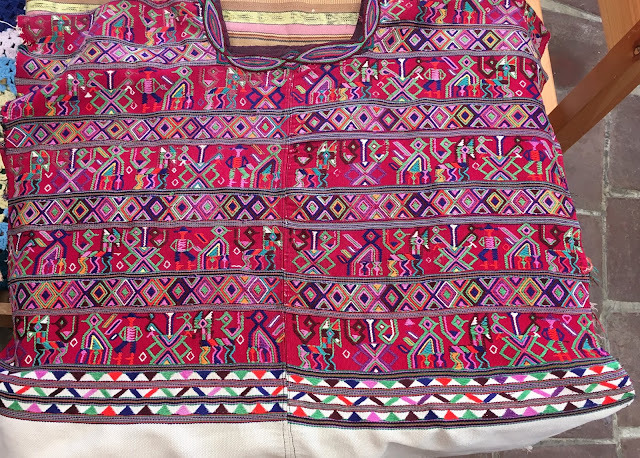 It was thrilling to see Maya women wearing their handwoven huipiles (blouses), cortes (skirts) and wide belts, a traditional clothing, or traje, that has changed very little in hundreds of years. To my eye it was exciting to see colors and patterns freely combined in outfits with little concern for "matching" as we would do in our clothing. Jessica, foreground, and Christina, background. Wearing traditional traje doesn't mean you don't use a cell phone! For me the highlight of the week had to be the two days we spent with the skilled weavers of the weaving co-op Asociacion La Voz de los Tz'utjiles. 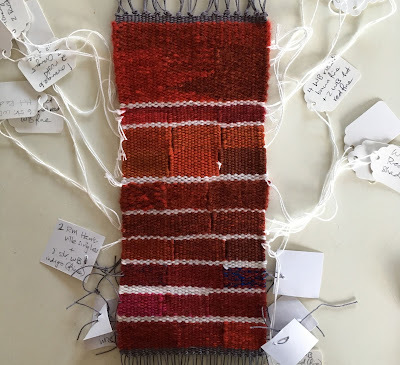 Adelaida, Christina and Jessica had warped and begun weaving scarves on backstrap looms, one for each of us in the group, and they instructed us patiently in a simple plain weave that was surprisingly difficult for me to grasp on this loom. I was horrified when after lunch the first day I went to pick up the loom to strap myself back in, and two of the sticks slipped out, losing part of the cross! Adelaida patiently reconstructed the cross and the loom and tied on a couple of lengths of yarn to hold the sticks in place. The view from the loom. Weavers say that "it's not the loom, it's the weaver" that determines the quality of the final product, and the backstrap loom makes that abundantly clear. We got to bring our looms home with us, and I look forward to finishing up the indigo ikat scarf on mine. My selvedges leave a lot to be desired, but I'm going to wear that scarf! There were a number of woven pieces in the workshop that I had to bring home. The intricacy of this indigo ikat (called jaspe here) entranced me. The whole piece is large enough to cover a queen bed, three widths decoratively seamed together. I'm not sure how I'll use this piece of green brocade fabric but I knew I couldn't live without it. Much of our week involved visiting various markets. We went to Central America's largest market, in Chichicastenango, and I was able to find small amounts of hand-dyed cotton-blend yarns. There was also a stall selling loom parts and other wooden weaving tools, where I bought these combs. Note the new double-ikat pants I'm wearing. A practical purchase! The best bargains of the week were found in the Los Bomberos market in Sololá, a flea market of used huipiles, cortes and other items. There I purchased probably my favorite pieces: these two huipiles and this jaspe corte, pictured at bottom. This green fabric is sewn into a tube that would be worn as a skirt, cinched around the waist. During my long trip home, I kept sneaking peeks at these treasures, pulling them out to study the patterns and try to determine how the weaving was done (the huipiles are a type of brocade). The more I looked, the more I saw. I felt as if I were trying to read an epic poem in the original Greek, or in this case, one of the 22 Maya languages. These works and others like them represent, thanks to the skill of generations of weavers and dyers, a monumental achievement in color, pattern, and beauty. The city of Antigua is designated a UNESCO World Heritage Site; it seems to me that Guatemalan weaving deserves similar recognition as a priceless human cultural treasure. Since I returned, I find myself wondering about how color is connected to place and to culture. 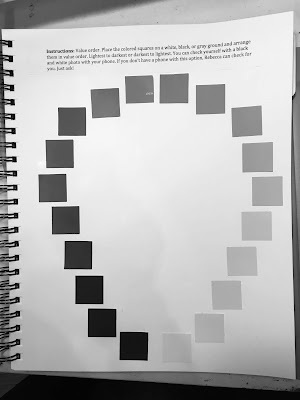 I am familiar with the basics of color theory and harmony and I have books that can tell me about the history and use of this or that color or dye. But I wonder, is it true that color use in tropical climates, for example, tends to be more bright and unrestrained than that in northern climates? Why? Of course colors are influenced by the local natural dyestuffs available. I saw vivid colors in naturally-dyed cottons in Guatemala that put the lie to the conventional wisdom that natural dyes are more subdued than synthetic dyes. I know that I will continue to research questions of color, place and culture, and the history of Guatemalan textiles. I'm not sure yet how this trip will impact my own work. I can say that when I arrived home, my own tapestries in progress looked pale in comparison to my Guatemalan treasures!